I made my own pineapple juice and used the pulp for this Pineapple Pound Cake. If you are so inclined, canned pineapple juice would definitely work. Life is short, do whatever is convenient and pleases you. This is a fun and happy kind of project for the summer. 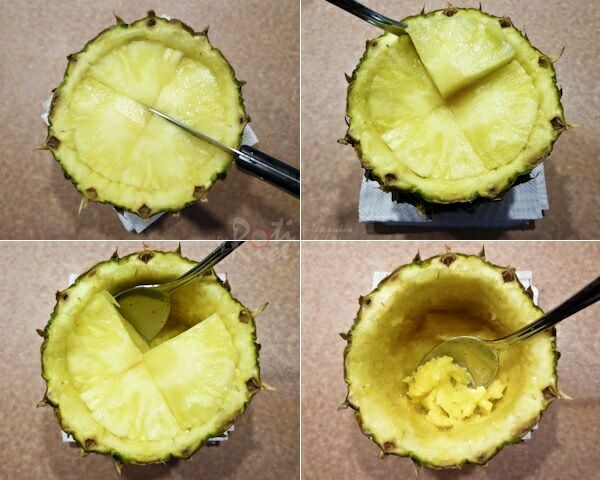 Cut off one quarter of the top part of the pineapple. 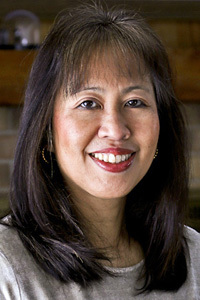 Carefully cut around the perimeter about ½ inch from the rind with a sharp knife. Then cut deeply down the middle to divide the flesh into quarters. Scoop out flesh with a spoon. You may need to use the knife to help loosen the flesh. Once all 4 quarters are out, continue to scrape and hollow out the pineapple. Reserve any juices and scooped out flesh for juicing. Cut off the core from the quarters and cube the flesh. Reserve the uneven pieces for juicing. Scoop out seeds from the cantaloupe with a spoon. Then scoop out little balls of flesh using a melon baller. Alternatively, you can also cube the flesh. Peel the mango and cube the flesh. Refrigerate cubed pineapple, cantaloupe, and mango. 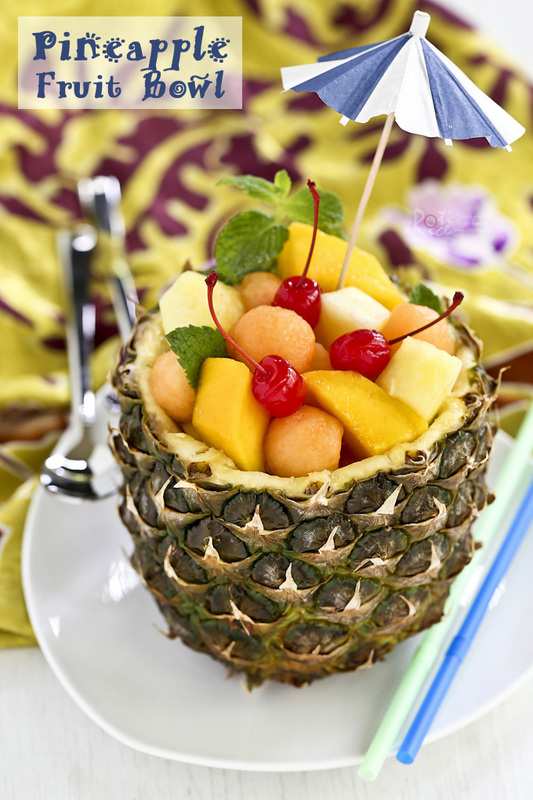 Place uneven pieces and scooped out pineapple flesh in a blender. Blend until smooth. Pour into a strainer and press with a spoon to get as much juice as possible. You should get about ¾ to 1 cup (180ml to 240ml) pineapple juice. 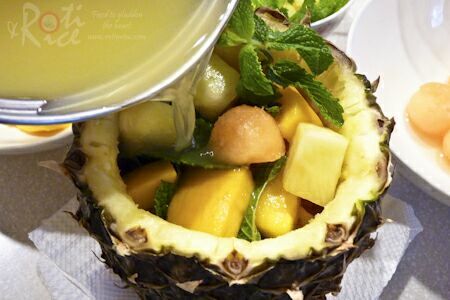 Combine pineapple juice and honey in a small saucepan. 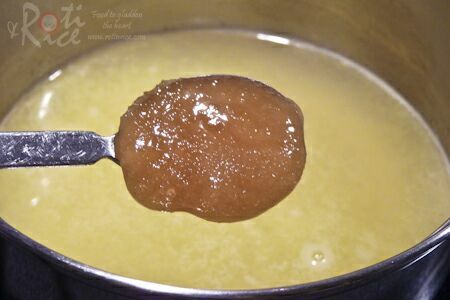 Heat just until honey has dissolved. Allow it to cool and then refrigerate. 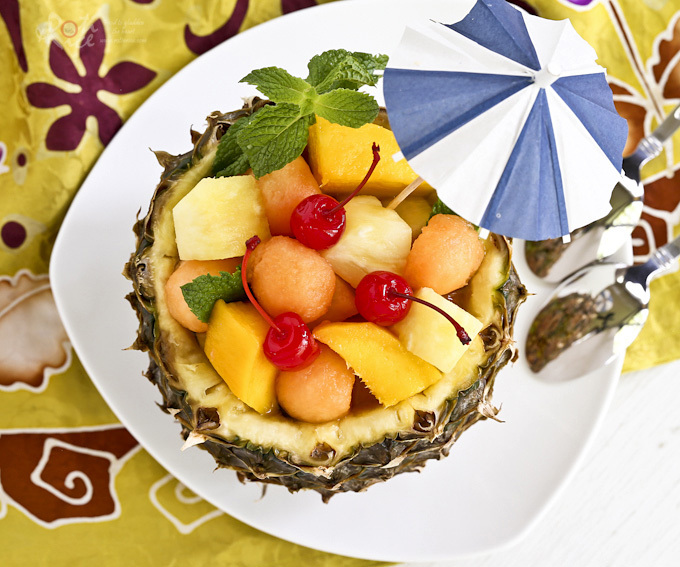 When ready to serve, place cubed pineapple, cantaloupe, and mangoes in the pineapple bowl. Top with cherries and mint leaves. 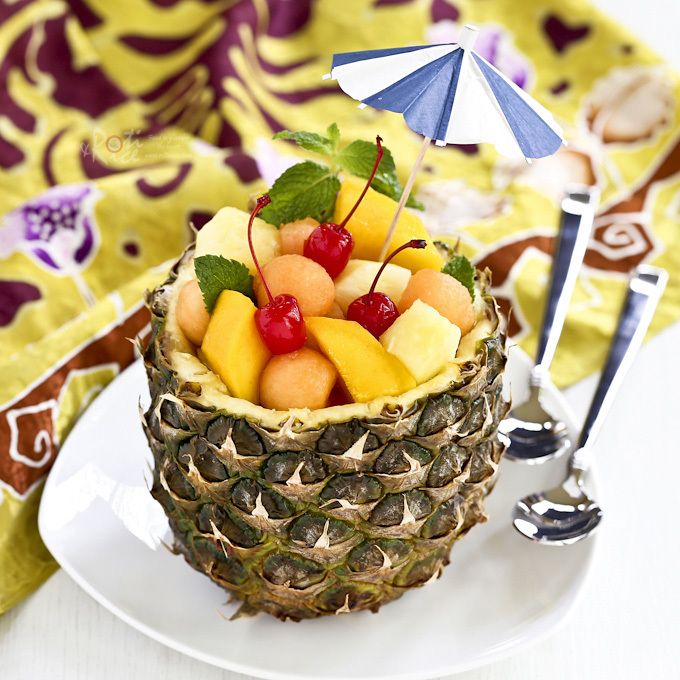 Pour pineapple juice over the fruits and enjoy.